I remember, when I was a kid, before we moved out to the farm, the circle that we lived on was awash with home parties. It was the mid 70's and it was all the rage. Tupperware parties, Home Interior parties, and Princess House parties. Many of the women on the street populated their homes with products from these parties.... Thus, many of the interiors of the homes on the street looked disturbingly similar. I remember the Princess House parties most vividly, because there was a lot of crystal and bone china, so children were NOT allowed int he room amongst the breakables. Mom's formal stemware (Esprite) came from Princess House, as did her frosted clematis dessert plates (Fantasia). She even had a English bone china coffee pot and to cups (Windsor Rose). Unlike Pampered Chef and some other companies that sell via the same "home party" formula, Princess House did not manufacture their own products, they would contract with companies to make products for them. This is evidenced by the tea pot I mentioned. The bottom was marked "Hammersley and Co.", a well known English bone china manufacturer who was also contracted by Tiffany & Co., on occasion, to make pieces for them. The reason for all this background on Princess House is that I recently found a piece of "Corningware" produced for said "house of Princessness", though I do not know what the time frame of availability was, because we had moved to the farm in 1977 and Mom stopped having parties for such things. I only found out about it's existence back in 2007 when I began hunting down vintage Corningware pieces in thrift stores. 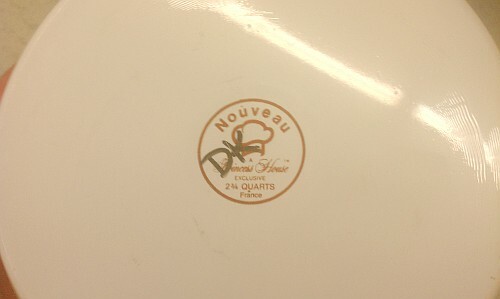 The cooking line was called Nouveau, though technically, there was nothing "New" about it, except maybe the shape and the fact that it came from France instead of Corning Consumer Products Division in the United States. It was produced by ARC (who also make Luminarc glassware and Arcoroc dinnerware) in France under the Arcoflam name, then shipped back to the U.S. to be sold at Princess House parties. 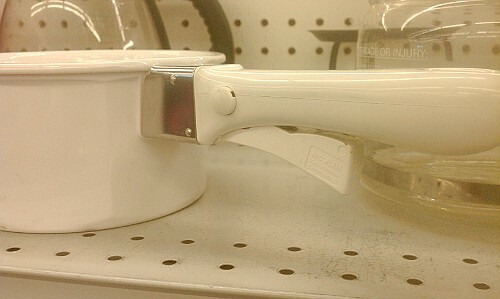 The shape is sort of a faceted round and the handles attach differently than original or current Corningware/Pyrosil/Pyroflam. 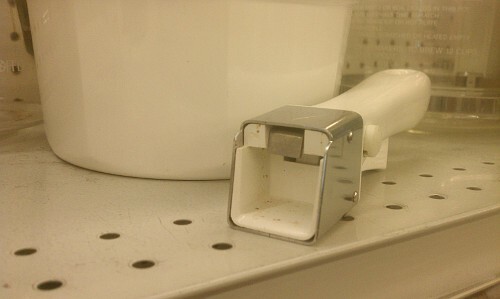 There is a large square "lug" on one end used for handle attachment. You place the handle over the lug and squeeze the trigger. If you look really close, you can see the Arcoflam name on the clamping trigger. 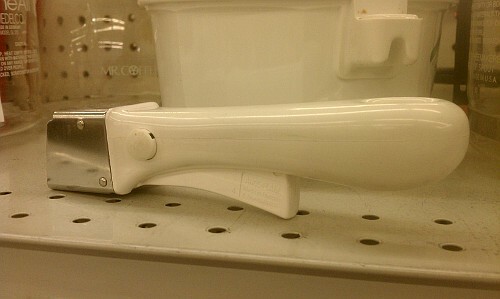 To release the handle, you simply press the button on the side of the handle. The formula for Nouveau is slightly different from Vintage Corningware. It's still a Ceramic Glass (Vitro-Ceramic), but the formulation is more inline with what is currently used on smooth cook tops, both radiant and induction. But for all intents and purposes, regardless of who is licensing what from whom and where the who is manufacturing under which product name and how it's sold.... it's still "Corningware". I attended and hosted many a Princess House parties. Sadly klutzy dusting led to the demise of many of my pieces. I had no idea that Corning Ware made some of their pieces. I still have a few pieces of nouveau and I love it. It is so convenient and versatile. You can't buy it anymore. I love the Nouveau cookware and still use it to this day. However, I have been searching for replacement lids for both my 1.5 and 2 quart pans. No one seems to have them and Princess House could not refer me anywhere to look for them. Any ideas? Ebay offers the best selection, and shopgoodwill.com comes in second. This is very true. Ebay and Etsy are probably your best bet, aside from checking the lid sections at your local thrift stores or the GoodWill and Salvation Army.... 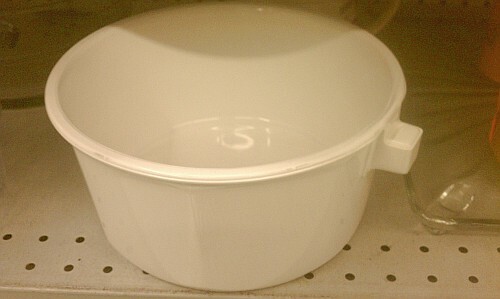 The Nouveau lids are similar to round Pyrex lids, but the knobs are smaller and the underside has "France" embossed on it. 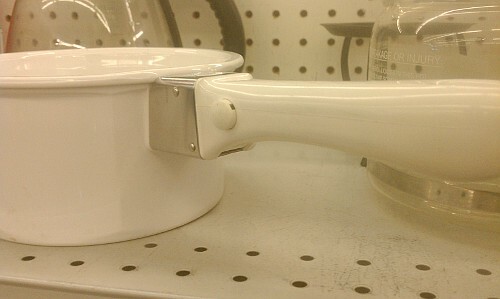 Where can I buy these handles ? Mike - They can usually be found at the GoodWill, Salvation Army, eBay or etsy. 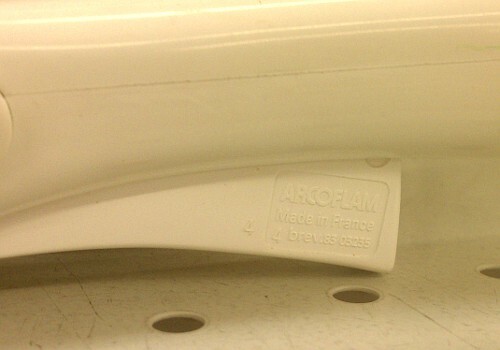 Sadly, the current models produced by Arcoflam do not include the Princess House Nouveau. So the handles can only be found second hand. I found a set of 6 with lids & handle for $55 at a local consignment store. I was so intrigued by the feel of the set & ease of storage. From reading your post, I guess I should grab it! There are also a large & small frying pan with lids for $60. I suppose I should hurry back. You can get all the Nouveau your heart desires on eBay. My advise would be to watch the shipping as some dealers are unrealistically high and also make sure the piece is insured before it is shipped. Barkeepers Friend cleans up pieces and restores them to like new. I have had these pans for years and unfortunately, this weekend, one of them was scratched on the inside bottom with a metal utensil. Does anyone know if it can be used after scratched? I am really bummed about it. Thanks for commenting. Taffy..... The pan should still be all right to cook in, however, the scratch may cause a little more "sticking" of any food. I hit the jackpot and found 2 different size sauce pans/ pots at a local consignment near my mom for $5 a piece with the handles and lids in great condition. I couldn't believe it! Now I am trying to find out how to use them. I've never used ceramic to cook with and I don't want to damage them. Yes, these are suppose to be able to do everything that Vintage Corning Ware can do... Electric, Gas & Radiant Cooktop, Broiler, Oven (Gas or Electric), Microwave, Freezer, Refrigerator. Can they be used on ceramic flat top stoves? Yes, they are actually great on Flat Radiant Glass-Ceramic cook tops. Because they are flat on the bottom, and don't warp like metal pots when heated, they make better contact with the heated stove surface and allow you to cook at a lower temperature; saving energy. Unless you are boiling water, you should never need to cook on your stove above the medium setting with Princess House Nouveau Cookware. Enjoy. Can't say I agree, but I do not saute very often. Find it works perfectly in microwave and regular oven. Retains heat really well, so great for serving dish on the table. I love the PH ceramic pans and use them for everything!! I’ve had only great experiences using on stovetop, microwave and oven. I find the same, that they retain heat very well. I enjoy being able to cook on low heat knowing that the heat is radiating more evenly. years ago, I bought a pan with steamer to hold vegetables on top. I use it often as one of my favorites in the kitchen. I love it!! what do I use to clean Princess House pots please ? If it's really dirty, I scrub them down with Barkeeper's Friend or Bon Ami. For regular day to day cleaning, I use Weimans Glass Cooktop Cleaner. dish soap and water...soft and scrub...Mr Clean sponge and soak every now and then in light water to remove any stains.. I Love my Nouveau Cookware that i have been using for 25 yrs now.. still need to replace 2 lids though and its good to know a corning lid will work.. I clean with dish soap and water and every now and then soak in light bleach water to remove any staining.. other than chips in a couple lids my set still look new.. I love my nouveau cookware! If cared for correctly they will last for a very long time. I have never before found cookware that can go from freezer, to fridge to stovetop to oven. They are non-reactive. The handles fit tight. I have now bought some replacements as they can chip or break occasionally. I have also started to collect some of the more rare models. I am a product manager, and am curious why they stopped being manufactured and if anything like them is being made. Are these electric stovetop save? Like the older style with the coils. Just found a 10 1/2" skillet at goodwill for $2.99! I just want to thank this website for providing all the feedback information on these Nouveau Princess house pieces. I didn't know that they had kept their value so well over the years, and I couldn't remember if I could go from freezer to microwave or regular oven with same food. Thanks to 'laughing dog', I see that I should probably thaw in refridgerator first, but will be able to do what I want. Thanks.